GUEST WRITER: Don Shanahan is a fellow Chicago film critic of "Every Movie Has a Lesson." He is an elementary educator who writes his movie reviews with life lessons in mind, from the serious to the farcical. Don is one of the directors of the Chicago Independent Film Critics Association (CIFCC). Please welcome him as a new contributor to Eman's Movie Reviews. Cynical critics and audiences will likely pontificate a headline of “Russell Crowe Goes Soft!” after watching his lead work in his new film “Fathers and Daughters” from “Pursuit of Happyness” director Gabriele Muccino. Watching the “Gladiator” Oscar winner play an ardent father of a heavy ensemble drama is a role that does not require the temperamental violence that normally fronts for the inner honor and heart we know resides inside many of the Australian tough guy’s most memorable roles. For once, he lets love do the talking instead of his fists. This so-called softness is not the buffoonery of Arnold Schwarzenegger from “Kindergarten Cop” or Dwayne Johnson playing the “Tooth Fairy.” Such is, instead, genuine maturity and it should be celebrated rather than chastised. “Fathers and Daughters” weaves two timelines of past and present from rescued 2012 “Black List” screenplay from first-time screenwriter Brad Desch. Through flashback, Crowe plays Jake Davis, a successful Pulitzer Prize-winning New York City novelist in the late 1980s. When he can pull himself away from his trusty typewriter, he is an imaginative and loving father to his doting eight-year-old daughter Katie (Kylie Rogers), whom he affectionately nicknames “Potato Chip.” When a sudden car accident claims the life of his wife and her mother, the two are left broken and alone. Jake’s grief and manic depression causes him to develop uncontrollable shaking and seizures. At the advice of his doctors and his long-time agent Teddy (Jane Fonda), Jake commits himself to a mental institution for seven months of treatment, leaving Katie with his sister-in-law Elizabeth (Diane Kruger) and her husband William (Bruce Greenwood). When Jake returns, the wealthy couple fights to adopt Katie away from the unstable and struggling widower. Concurrently, over 25 years later, Katie (Amanda Seyfried) has grown up to become a graduate student in Psychology employed as a social worker for Dr. Korman (Octavia Spencer). Specializing in children’s cases, Katie takes on a new mute patient named Lucy (Quvenzhane Wallis of “Beasts of the Southern Wild”). Away from work, the Katie of the present day carries self-destructive tendencies to drink heavily and bed just about any guy that hits on her. Her downward spiral changes when the therapy sessions with Lucy end up working both ways and she meets Cameron (Aaron Paul) instead of another low-life. Cameron is a gentle and patient struggling writer. The young man has idolized and emulated his work after Katie’s father’s, particularly Jake’s most-celebrated work, the novel “Fathers and Daughters” about his relationship with Katie as a child. Their growing relationship brings both challenge and inspiration. In fairness, “Fathers and Daughters” lacks a strong unifying thread and replaces it with that compelling question of “what happened.” Since you do not see Russell Crowe in the present day timeline, you cannot help but fear the worst for Jake Davis’s fate. The film can be a bit disjointed in interlocking its twin tangents and balancing its hopefulness on one end and the mounting depression on the other. Without question, the compelling drive of the Muccino’s drama that builds your investment is trying to piece together how the sweet little girl with a wonderfully loving father turns into the loner mess she appears to be later. That flawed path is still a worthy endeavor not destined for a cliché or tidy happy ending. Those who do not have the stomach for absorbing or the comfort level for observing so-called “daddy issues” will turn their nose at these two perspectives and call out the saccharine drippings of melodrama. 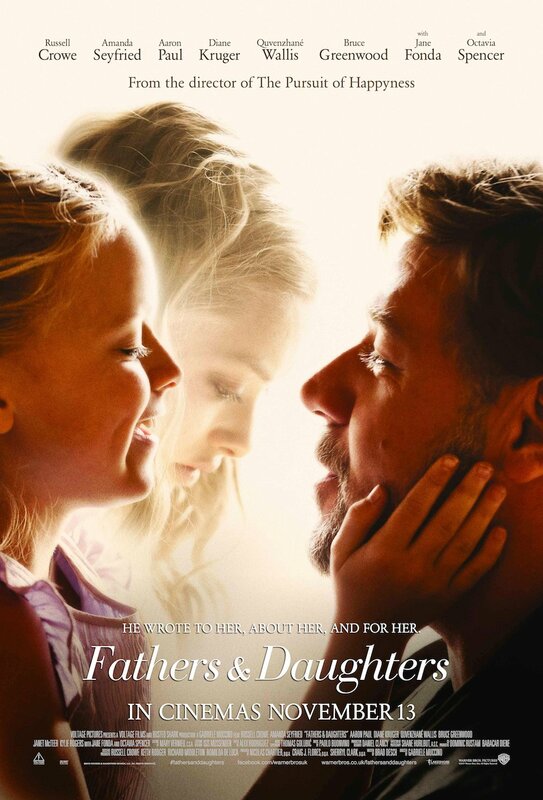 The overall capacity of the able and honest heart of “Fathers and Daughters” is a winning quality that the cynics can choose to discount all they want. So be it. They have their own genres and therapy bills. Others can choose to embrace the sentimental chance to hug your children a little tighter. Click Here to join our weekly email list. One email, every Friday, to get my latest reviews. Don't forget to follow me at @SpoilerDashFree. You can also follow Don at @casablancadon.